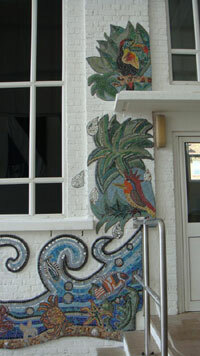 Evolution Mural, celebrating Charles Darwin and the 150th Anniversary since the publication of The Origin of Species. 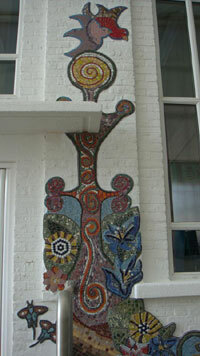 A year after Mr Molloy, the Headteacher of Claremont High School, discovered the glittering mosaics of Artyface in Maud Milton's studio during London Architecture Open Weekend in 2008, they were celebrating the completion of a huge legacy mosiac. Together they worked with Ms Guy, Head of Art, to raise the funds from the National Lottery, Awards for All, and the school match funded the successful lottery grant. 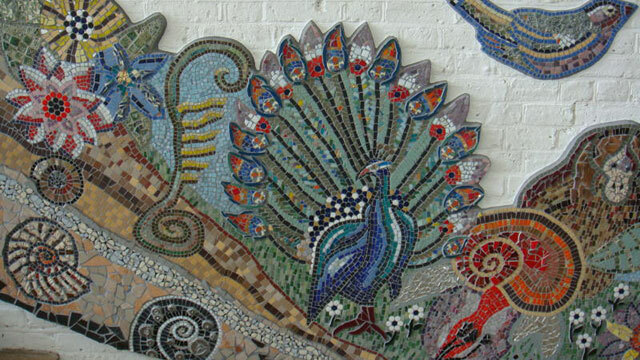 12 months later, with hundreds of people involved, thousands of tiles glued painstakingly into place and bucket loads of talent discovered and nurtured, the walls of the school have been transformed into colourful, rolling, beautiful scenes of nature. The Art Department decided Charles Darwin's theory of evolution would be a timely theme as it was the 150th anniversary of his publication of The Origin of Species. 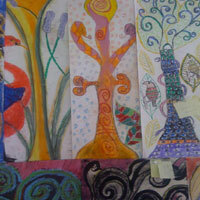 Maud and her team of Jill Tattersall and Leona Matuszczak, as well as Claremont High School's talented art department, ran drawing classes where ideas and themes were expounded upon and drawings and designs were made. 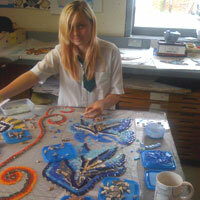 Rebecca Tyndall, Clement Riches and Julie Smith joined in on the making of the mosaic, when pupils, parents, teachers and artists hand-cut the individual ceramic and glass tiles for this huge design, working together as a vast team to represent, in mosaic, the Big-Bang, the oceans and ameobas, early life forms and sea-life, through to rainforests, birds and insects, mammals and finally human-footprints. 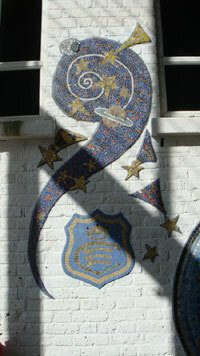 With artistic license the pupils and staff had fun with colours and forms, making sure the school-logo was in at the beginning, and making good use of the real-gold Venetian tiles! The mural is up and looks fabulous and pupils are increasingly using the space in their free-time as it has character and they like it. 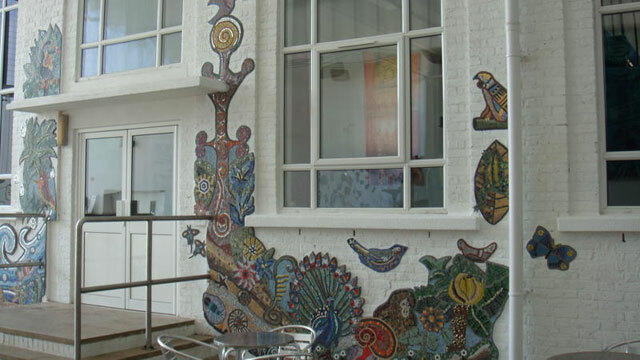 The mural has achieved its aim: to enliven and warm up a cold and sterile space and to spread the skills and passion for mosaics. The Mayor for Harrow attended the Grand Opening and cut the ribbon in front of proud pupils and their parents. The local MP and other dignitaries were treated to a live performance by the school's orchestra of a piece composed especially for the mural's launch. Pupils were extremely happy with the results of their hard work and the mural and the live performances illustrated the strong school and community spirit, evident in the whole evening. It is great to see people evolve through education and involvement, through opportunities like this mural project. 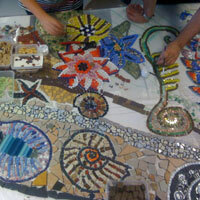 Parents at the opening who missed the last rounds of community workshops were keen to have a go at mosaicing or other arts and discussed their enthusiasm with the artists at the opening. 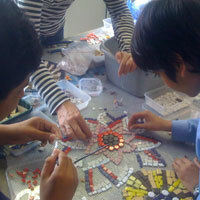 This is evidence that the project has built bridges between parents and education and volunteering. 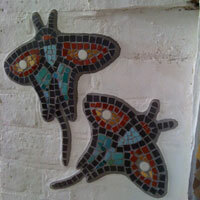 One of the Art teachers has begun mosaicing as a hobby, another positive outcome and the developing of professional skills. Other parents and pupils attending community workshops discussed possible projects for their homes and this is another good achievement. 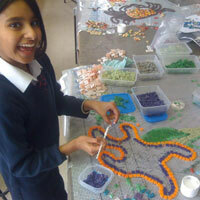 There was lots of enthusiasm to learn more about mosaicing!